Explanation: Where are the hottest stars in the nearest galaxies? 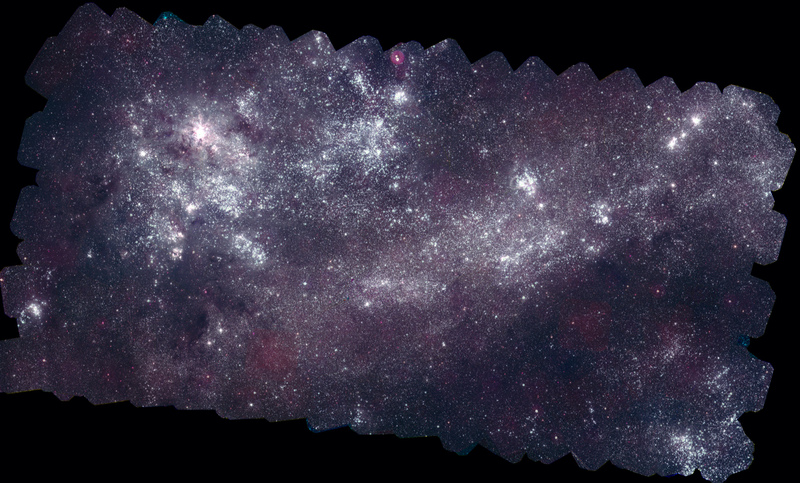 To help find out, NASA commissioned its Earth-orbiting Swift satellite to compile a multi-image mosaic of the neighboring Large Magellanic Cloud (LMC) galaxy in ultraviolet light. The above image shows where recently formed stars occur in the LMC, as the most massive of these young stars shine brightly in blue and ultraviolet. In contrast, visible in an image roll-over, a more familiar view of the LMC in visible light better highlights older stars. On the upper left is one of the largest star forming regions known in the entire Local Group of galaxies: the Tarantula Nebula. The Large Magellanic Cloud and its smaller companion the Small Magellanic Cloud are easily visible with the unaided eye to sky enthusiasts with a view of the southern sky. Detailed inspection of the above image is allowing a better galaxy-comprehensive picture for how star formation occurs.